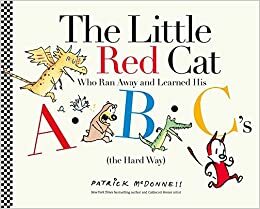 Summary: In this nearly wordless book, a cat runs away and gets chased by an alligator, bear, and chicken (in that order). The story unfolds alphabetically, but kids will have to figure out what the word is for each picture. There’s a happy ending, as a unicorn distributes valentines; the cat waves goodbye to his friends, uses an X on a map to get home, gives a gigantic yawn, then catches some zzz’s. 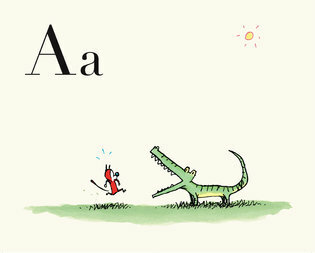 The whole alphabet is listed on the last page, along with a list of all the words shown in the story. 48 pages; ages 3-6. Pros: An intriguing introduction to the alphabet, engaging readers who will have to both figure out the word for each letter and the story those words are telling. Cons: The title doesn’t exactly roll right off your tongue.